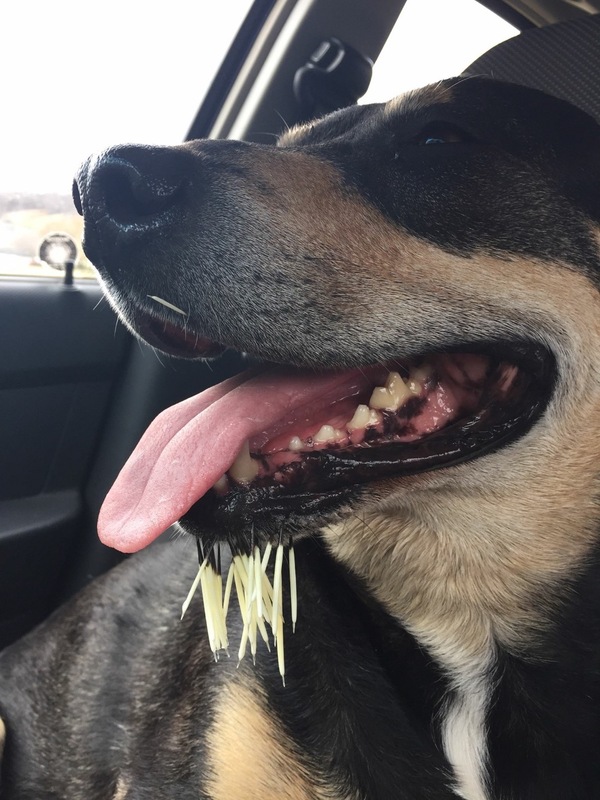 Mahola, Nestah, and Soljah had a nasty encounter with a porcupine. The female Mahola took it the worst and has required extensive surgeries to remove quills from her heart and lungs. These dogs are the love of my dear friend Dennis's life they travel everywhere with him and are loved by the special needs clients Dennis works with. Dennis is a youth worker at the Street Culture Project and runs a small Organic Farm outside Regina. Dennis has had to take weeks off work to travel to Saskatoon to be with his baby girl. The Vet Bills are nearing $8000 and climbing to save Mahola's life so I have started this campaign to offset some of the costs. The quills just keep on coming both dogs making another return trip to the vet. One in Mahalos rib cage which broke off when Dennis was trying to remove it. Some days the dogs appear to be 100% on the mend and then some not so good days. Dennis tells me since Saskatoon's surgery he's been back to the vet 7 times with number 8 probably soon. On the plus we received a call from national geographic potentially wanting to do a spot for one of there shows on this whole ordeal. Go Fund Me the team has also been in contact as this has been an extremely connective campaign wanting to showcase some of our story as well. Couldn't have done it without you my friends so thank you! Back to the vet again! More quills removed from his neck and a nasty one stuck sideways in his foot. We hope this is the last of them as this poor guy is in some serious pain. He had been hobbling around on three paws for a few days so this is good news that they found the culprit. Back home tonight but lots of bandages and medicine. I swear dad if I see one of those prickly dudes again I'll walk away! Thank you again for all the kind emails of support for these three beautiful dogs. I have received a ton of emails asking how things are going so here is another status update. Mahalo is on the mend and although she is very tired of being in the house the vets have said no strenuous activity till the end of the month. Nestah still has quills in his neck tissue although they are softening up the worry is always that they will migrate to somewhere more critical. Dennis and kari continue to watch him closely. 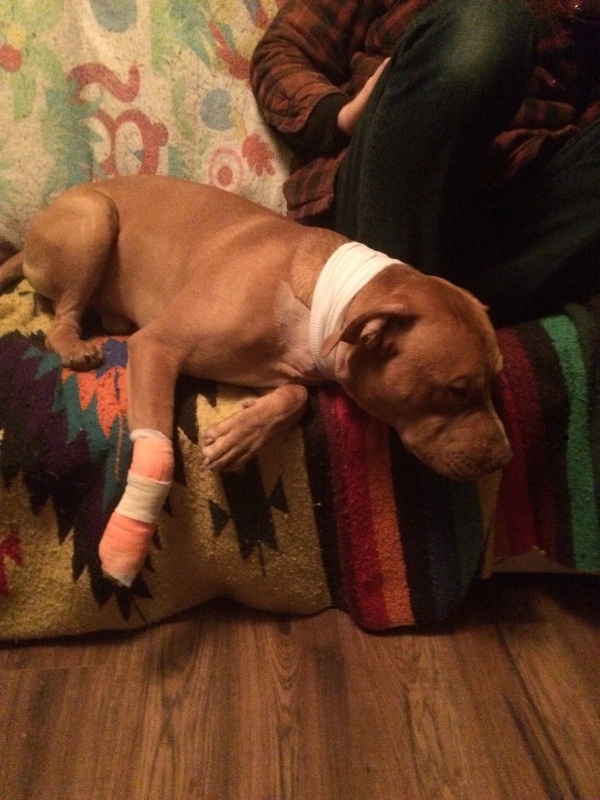 Soljah is fine and just wants to get back to business as usual. These ladies are the real deal and have my upmost respect for all they do! I saw this news story on the Internet. I was very shocked and very happy to see so many people who care about these dogs. I was a little more interested than normal because I too own a pitbull and I think they are tremendous pets. Smart, loyal, gentle. So I had to check out the GoFundMe page of this morning to see how much support these dogs have, and I was overwhelmed with the amount. Then I saw Sue's comments about ending the campaign. My first thought was who put you in charge of dictating when a campaign should be stopped. You don't know what the total that bills will be and expenses for this man. Quit being a busybody and mind your own business. Sue's comments were only topped by Joanies ignorant comments. This is no place and spreading your agenda about pitbull attacks. In my opinion your comments are totally out of line and out of context. Maybe it's your priorities that are screwed up and not everybody elses. Helping others, who help others is how we can reach out and SHOW, not just mouth the words but actually show that we care about those in need. If every FB member was to donate $5.00 to $10.00 we could provide for all the financial needs of these 3 dogs! It's not alot of money put on a few people, its a few dollars SHARED by many, many people! Please help those who help others. Give today! I'd really like to donate to your cause it's a shame people like Sue think they can throw their weight around anywhere they please. I hope you did not close it because of people like her. I am an intelligent individual who cab clearly see the goal has been surpassed, but it is my right to donate past that point if i so choose. I hope your puppies are healing well and you have all you need! Judi, I had a Jack Russell cross get hit across the side of his body a few years ago. 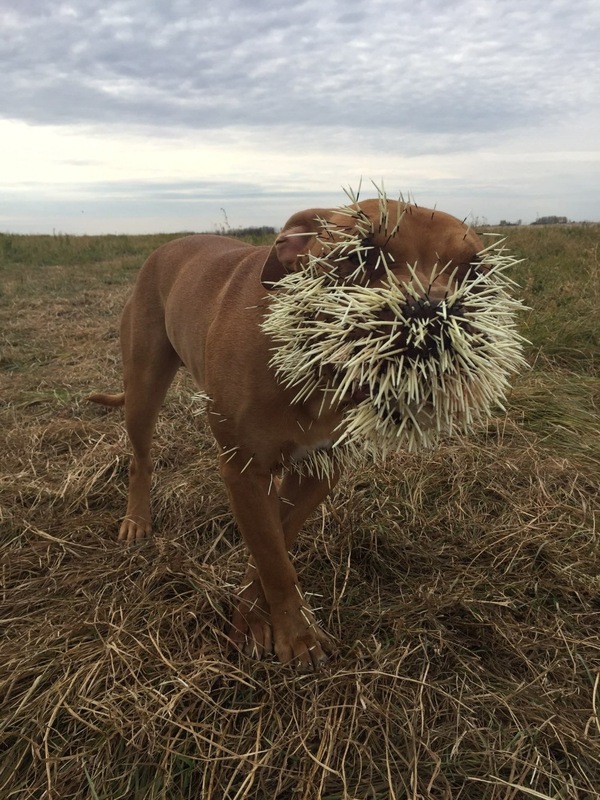 I had no idea at the time but found out very soon that the quills will migrate inside the dog's body. 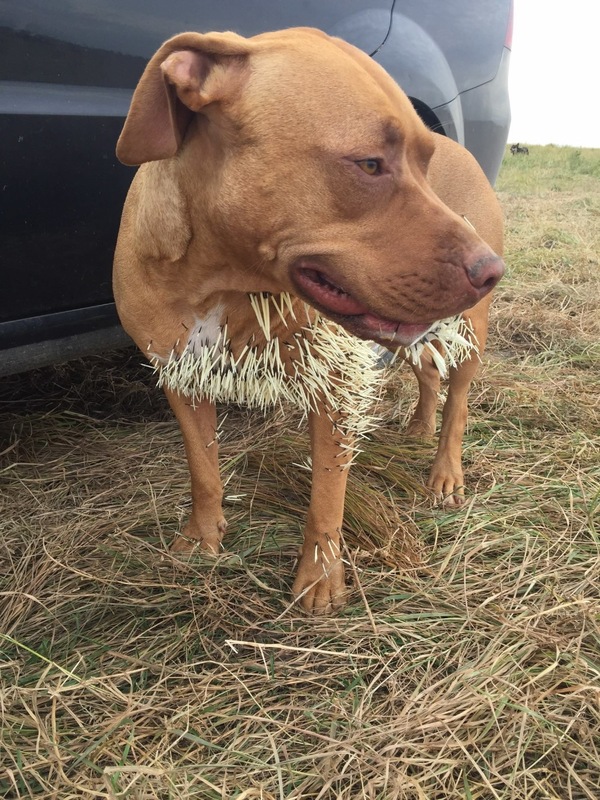 My dog had surgery that day to remove 13 quills that were inside threatening to puncture his heart and lungs. The vet warned me that there could be more and sure enough, I had to take him back 4 more times for surgery over the next couple of months. He'd be fine for a while and then suddenly look unhappy. I'd search and sure enough would feel them under his skin. I was so relieved when all the quills were finally removed and so thankful for my vet! All the best to these 3 dogs and their owner. I feel good about donating, whatever the intent, things happen for a reason, and I have faith that my donation will go to good hands. I love dogs, especially the type that you have. Take care and please send updated pictures of them. Especially that one that took it the worse on the face. My heart just breaks for him. This is so amazing!! I will send prayers!! Hopefully some can pray for my puppy too!! It is amazing how much support you are getting! I feel so bad for these poor puppies. I'm definitely a city person and never eveb realized a porcupine could do this much damage or that the quills would continue to migrate. I had a pit bull for 17 years before she passed. She was the sweetest, most lovable dog you could imagine. People formed a different opinion after meeting her. While there are a few negative comments here most people that are animal lovers respect the fact that the owner of the dogs is doing everything he can for them to makr sure they live a long, healthy, happy life filled with love. What more can anyone ask for. I am so glad to read that you were able to raise the money you needed to take care of your babies. They are all lovely looking dogs and the photos made me absolutely ill. To imagine what agony they were in -- those poor , poor, dear pups. I am so glad that they are home now and doing fine. Stay with them as long as they need you at home...If you are able. Oh those poor babies. I saw this story on weather.com just now and was quite compelled to see how they were doing. I tried to donate but donations are closed. 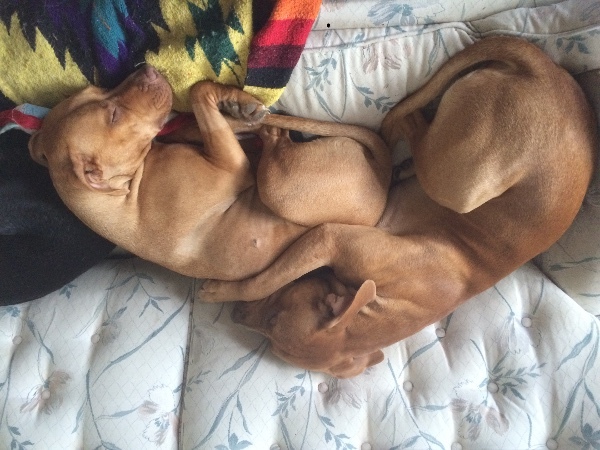 I am so happy that your dogs are doing better and I hope you reconsider opening donations back up again. Good luck to you and your precious animals. No doubt this setback has amounted to a profound, life experience for you Mike. Am absolutely overjoyed to learn of your pack's progress. As I run my two, yellow labs (Zabba and Kya) daily in the woods, I sometimes worry about them. As an eventuality, I hope you might broadcast some insights concerning your dogs' recoveries, so we followers may better prepare ourselves, and learn from your experience. Praise the Lord, and one day at a time. I hope all your pack are "out of the woods", sooner before later. You are in my prayers. Dogs are precious. I hope that your beautiful ones all make a full recovery. I agree with Loralie. The campaign to save these dogs should continue. The vet bills could go even higher. I have a dog and I know from the past that vet bills can be way more than what we expect. Keep the campaign open. As of 8:30 am Eastern Time you have surpassed your goal by $1200.00 dont you think that its time to close your fundraising efforts? 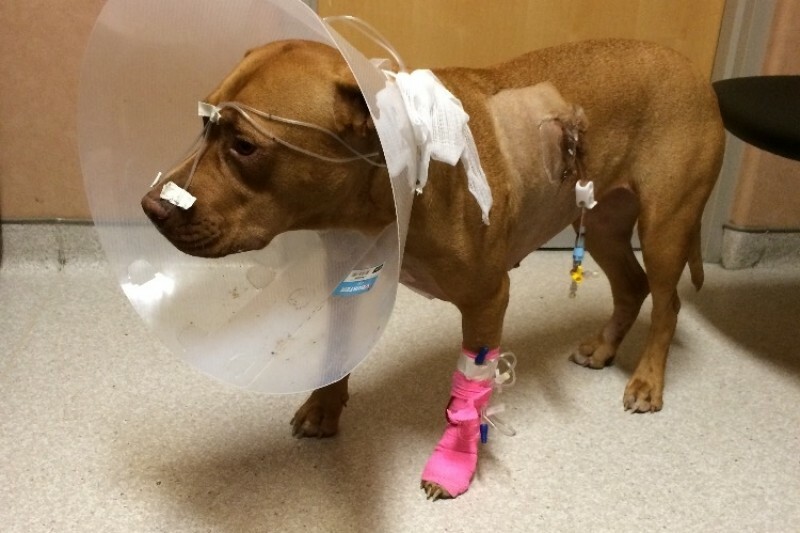 This story has now reached enough people to pay off your vet bills. Please do the right thing. just curious: hows the critter???? Poor doggies. Wishing you all a speedy recovery. I see you've blew past your goal, but here's some funds for treats.